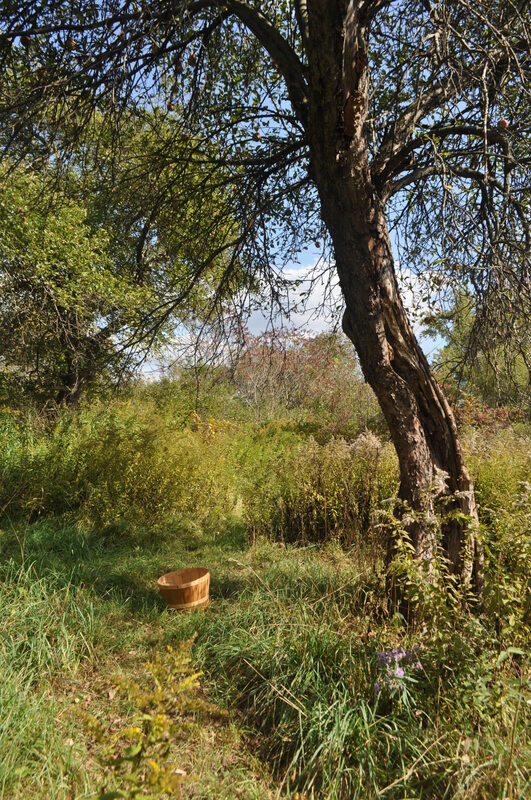 There are five old,gnarly,unkempt apple trees on our rented homestead property that have been providing a steady stream of apples since early September. The apples are as gnarly looking as the trees sometimes. As a matter of fact, they look about the same as the expensive organic apples I’ve seen at the grocery store. They’re not certified organic but close enough for me and the price is right. Technically, they aren’t free since we pay rent to have the privilege of using the apples. My goal is to maximize the potential of the property while we are here and to reap the benefits of everything here…”weeds”,trees,dirt….if it can give me food or save me money in some way, I’m going to utilize it to get the most bang for our rental bucks. So, the apples trees are a pretty obvious boon here. I swear, he’s happier eating this apple than he looks. 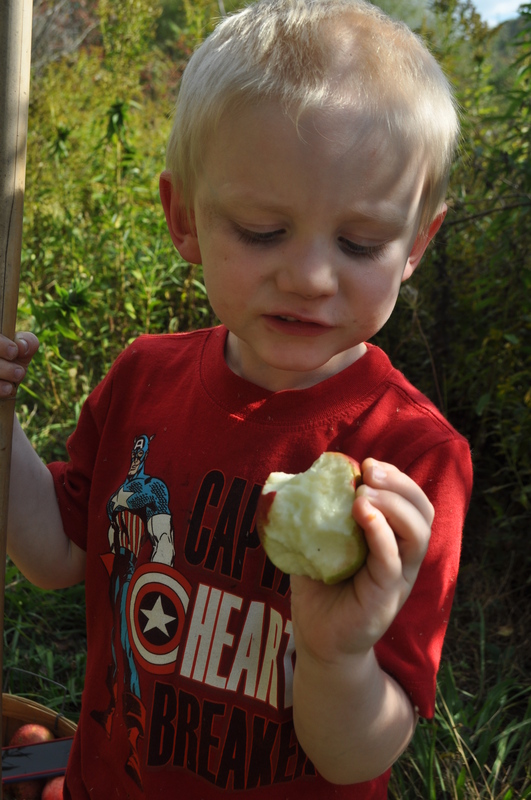 My littlest guy was the only one who had no reservations about just eating the apples straight up. This school year, my kids have to take a snack every single day. There is zero room in our food budget for snacks. The apples are filling that gap quite nicely. Apple bread/muffins,apple flautas,apple pie roll-ups (SO easy and just use plain white bread), applesauce,apple this,apple that. Everything apples. I cant wait to try apple-peanut butter cookies. 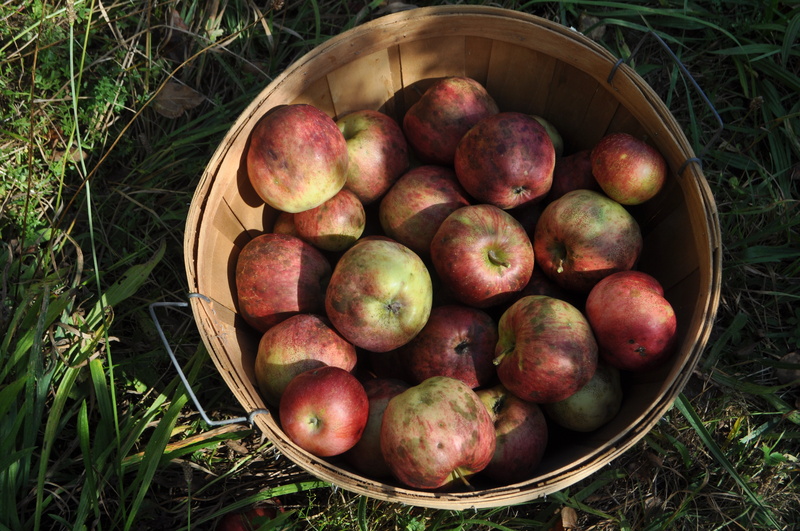 I’m slightly embarrassed to admit that there have been so many apples that have fallen and weren’t picked up in time (WASTED FOOD! ACK! )that our backyard smells like hard cider. I half expect to see drunken deer stumbling around one of these mornings. They definitely have been partaking of the bounty,too. 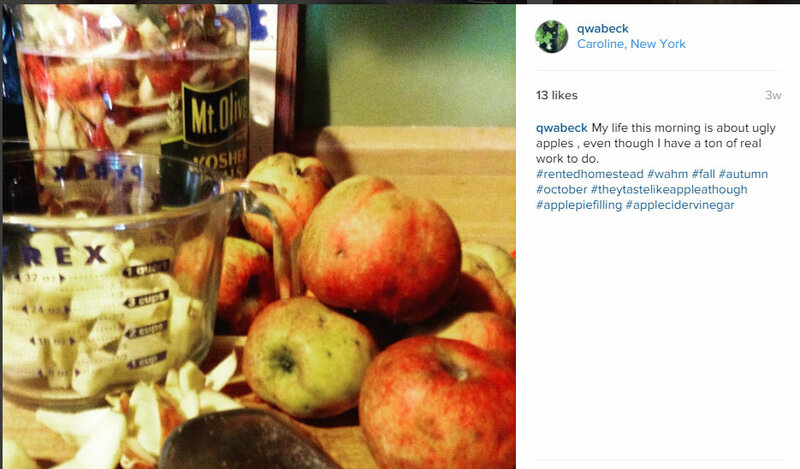 Using every last bit is kind of my thing so with the apples, I use the peels & cores to make apple cider vinegar. I know ACV isn’t all that expensive but making it myself is just one more thing I don’t have to buy. I do seem to use a lot of it,too. Every little bit helps. You wonder where on earth those “must bring a snack” rules come from….obviously someone not in tune with folks that are on food stamps or visiting food pantries already…..OR getting free breakfast and lunch subsidies. When I volunteered at the food pantry we had moms come in scouring the shelves for snacks…..of course no one ever donates that stuff because, well they’re not necessary….they’re snacks. Rinse and repeat. Bah. I was driving the other day and noticed pears on the ground. I hope someone gleaned them. We have a dozen apple trees out back. We can’t even start to use them when they produce well. No one has ever stopped and inquired. Good for you in being able to make use of those apples…many don’t have the ability. I was so surprised by this snack thing at their new school. It’s a rural poor area and there are so many ways the school is in tune to that. I don’t get it. You make your own ACV? That is so cool! Is it hard? I have an apple tree that I’ve never once got apples from because they are always eaten by birds long before they are ripe. Would be great to do something with the leftovers they leave.